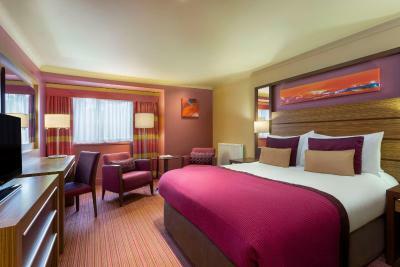 Lock in a great price for Ashford International Hotel - QHotels – rated 8.4 by recent guests! My husband and I enjoyed our stay very much. The receptionist was very polite, patient and kind. We felt at home every single minute of our stay. Our dinner was superb, with Angie Brown delivering excellent customer service. We were also celebrating our 18th year Aniversary, and Angie made sure we have a good time and laughter. We also, took advantage of the other facilities i.e. pool, steam room etc. Absolutely value for money. Great rooms, clean and roomy. Fantastic pool and brekky. All good! Staff were very polite, welcoming and ensured they made the stay pleasant. 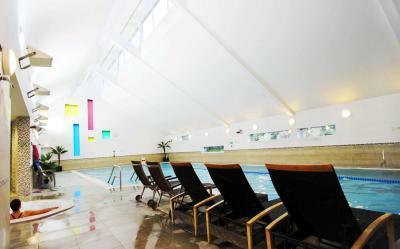 Pool and gym were great to use and well equipped. Food was varied and good quality. Rooms were spacious and bed was comfortable. The room was lovely, cosy. Hotel was spotless and modern. The facilities were good. Swimming pool was very nice and clean. Made to feel special soon as you arrive,great concierge,was on trip to euro Disney,parking and taxi all sorted out for me,rooms, outstanding, lovely big bath,and great shower,good TV, comfortable bed,great food, recommend the steak,and lovely breakfast,and use of the pool,steam and sauna room, great bar area,and in the morning,the concierge,rang the cab company,to make sure the cab would arrive on time,thanks to everyone there. Staff were friendly and very helpful. They are producing their own honey which they use and sell to raise funds for charity. 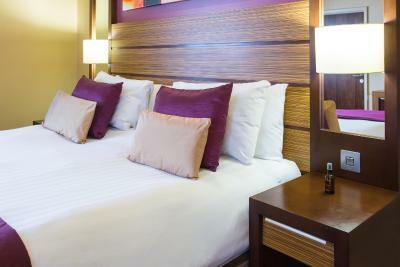 Ashford International Hotel - QHotels This rating is a reflection of how the property compares to the industry standard when it comes to price, facilities and services available. It's based on a self-evaluation by the property. Use this rating to help choose your stay! 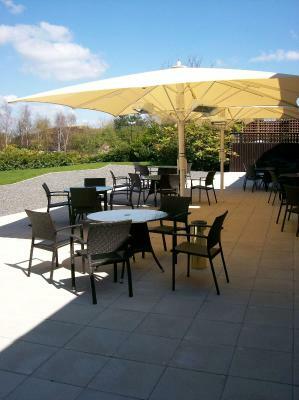 One of our top picks in Ashford.The Ashford International Hotel is just minutes from the M20 and the Eurostar connection. Air-conditioned rooms have flat-screen TVs, and the hotel also features a restaurant, pool and hot tub. 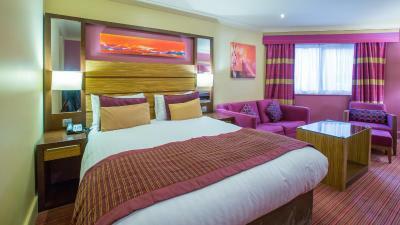 When would you like to stay at Ashford International Hotel - QHotels? A spacious, modern room with free WiFi, a bath and shower, and tea/coffee making facilities. Please note that extra beds will not fit in standard rooms. 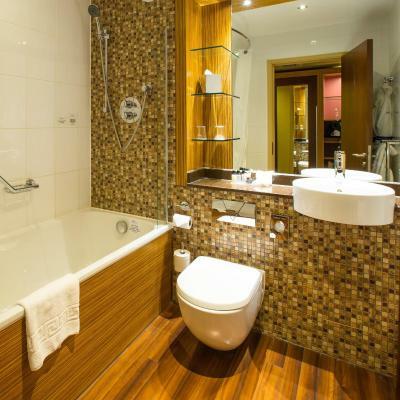 These rooms feature additional living space with a flat-screen TV and satellite channels. 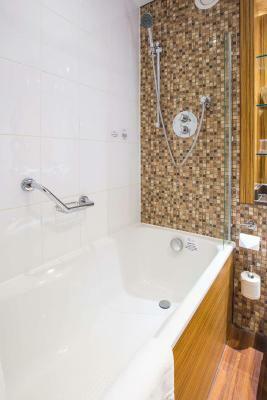 Additional amenities include complimentary mineral water and toiletries, and bathrobes. Children stay free when sharing with 2 paying adults, paying only for meals as taken. House Rules Ashford International Hotel - QHotels takes special requests – add in the next step! Ashford International Hotel - QHotels accepts these cards and reserves the right to temporarily hold an amount prior to arrival. Not close to any restaurants. Location could be better. Clean and spacious room with all the necessities available. Very good free WiFi. Amazing breakfast with a lot of choice and good quality. Food in the bar was amazing too. Prices of drinks at bar very expensive. Mattress was a bit old I could feel the springs. Pool very busy so didn’t go in. Free WiFi was good. Staff very friendly. 10% off at the Ashford outlet stores. Free parking. Decor is pretty. 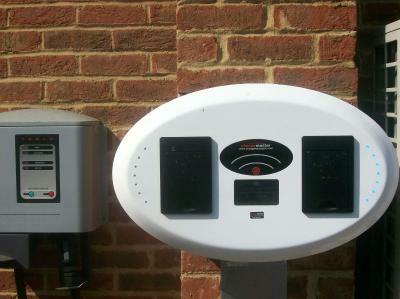 Very relaxed atmosphere, great location for exploring Kent. The tea pots were all quite dented so always spilled when poring tea. One down side, there was no option to help save water and save our towels. So they were replaced each day. We’d have been happy to reuse to help save our plant but we’re not given the choice. Breakfasts were really tasty. And our superior room was lovely. The staff were very helpful and quick to respond to our questions. Hotel is a little old.... but ok. Restaurant staff were very busy and manager was quite defensive when we pointed out we had waited to be seated for 15 minutes. Bar and restaurant staff had numerously told us someone would see to us but did not feel it appropriate to seat us. The food was dreadful. Pork belly was just mostly fat and the mains were completely over salted. The manager took drinks off the bill but it really ruined the evening. Staff in reception were lovely. Very helpful. Spa and pool were extremely good. Toilet in our room would not flush properly but didn't take away anything from our stay. This is my fourth trip to Ashford Intl hotel. Used for business and pleasure in the past. Excellent hotel for getting away business or pleasure. Took my wife away for her birthday again (we went last year). She loved it. Been away to Jamaica in Feb and going to New York in October this year so great for a simple getaway. Food was great and the room service which we used for the first time was also good. Seem to get more food or maybe it's just what we ordered. Staff and free wifi very helpful. Will be back soon.